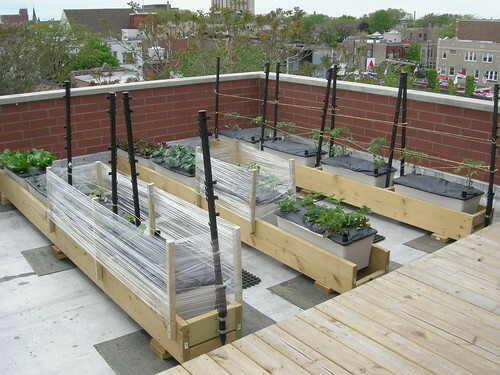 LTH Home > Chat > Gardening, Farming and Foraging > Earthboxes, anyone? I gave up on my vegetable garden when I had kids of an age likely to trample it, but since I hardly use my deck for its intended purpose, and it's quite a bit sunnier anyway (especially after half the branches on my Dutch Elm were ripped down in the big storm of August '07), I decided this was the year... to join the cult. 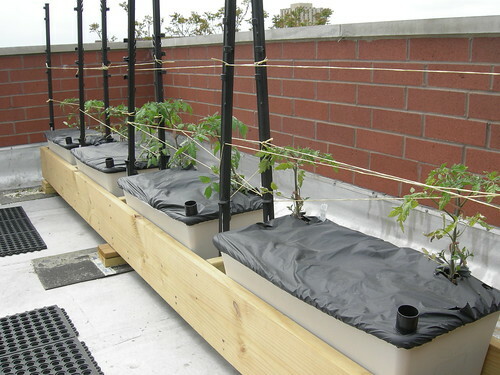 Touted as the "garden of the future," the EarthBox is an innovative container gardening system invented by a Florida tomato farmer, Blake Whisenant, after a hurricane wiped out his crop in 1992. Two and a half feet long, 15 inches wide, and a foot tall, the EarthBox is self-watering and self-fertilizing, and its fans say that given enough sunlight even the brownest thumb can coax a crop from it. 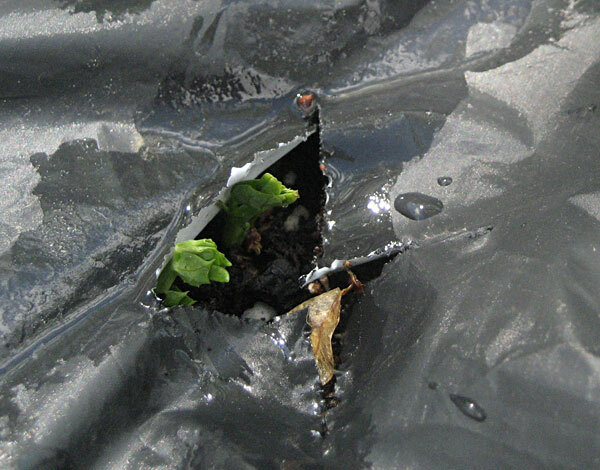 Plants grow in a sterile potting mix of peat moss and vermiculite and are nourished by a strip of fertilizer spread across the top. 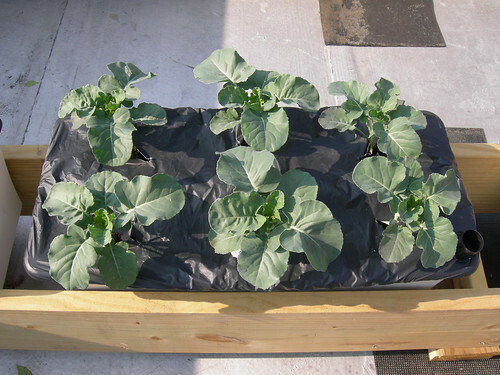 Water in a 2.2-gallon reservoir at the bottom of the box, which is filled through a tube jutting up from one corner, wicks up through the soil and into the roots, rather than seeping down from above, which means the box uses significantly less water than a conventional garden. 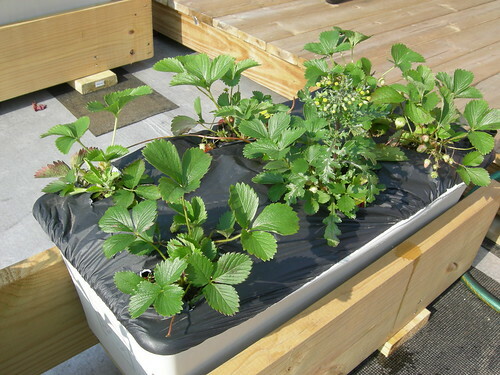 A lightweight plastic cover--the shower cap--acts as mulch, keeping the soil moist and discouraging pests and weeds. To be honest, you could build its equivalent easily for less, and many folks do, as a search will quickly reveal. 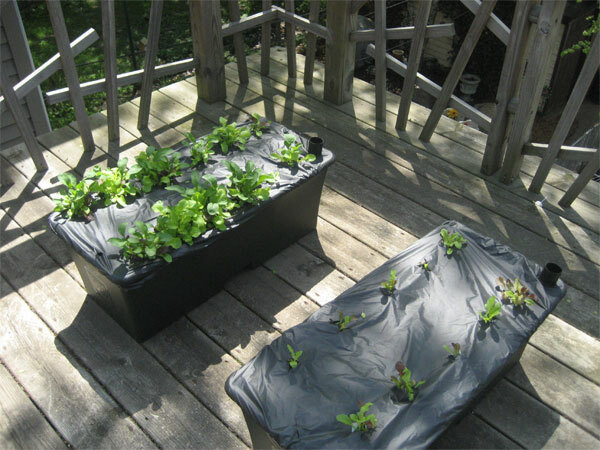 But convenience is a big deal when trying to get something done on the weekend, and rather than have the kids' "help" in sawing down a Rubbermaid tub, I bought two of the kits, and planted lettuce in it about two weeks ago. 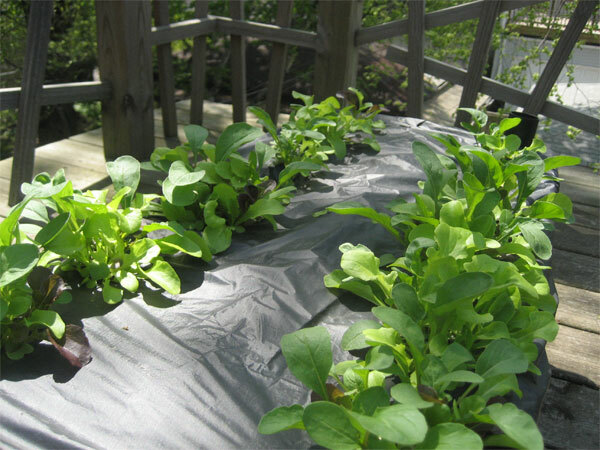 I had some doubts whether lettuce would find its way through the holes in the "mulch" cover, but sure enough, it just took a few of the recent warm days over the last two weeks to produce lots of the Burpee Gourmet Lettuce Blend. The Burpee Organic Mesclun Blend has been somewhat less impressive so far, but maybe it just takes a few more hot days. I went with tomato, strawberry, onion, bell pepper, hot pepper, broccoli, zucchini, cucumber, eggplant, Romaine lettuce, and red leaf lettuce. I'll post my earthbox updates on this thread, since it's easily recognized by title. The wind has done some damage but the cool weather hasn't hurt too much. The tomatoes and peppers aren't growing that fast, but I'm guessing the soon to come, warm weather will change a bit of that. 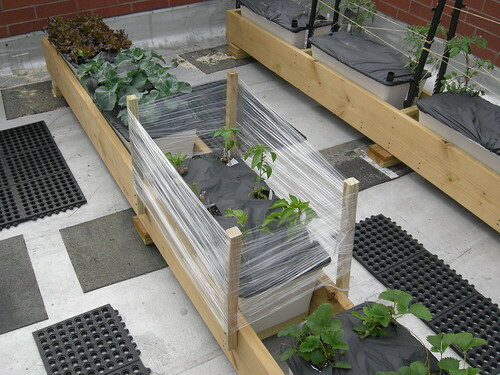 I'm looking into creating a wind barrier of sorts, especially for the "newer" plants that can't take the high winds. Here's some progress so far - I'm already eating salads out of the "urban garden." Really nice job, folks! Almost as exciting as Hammond's pig! 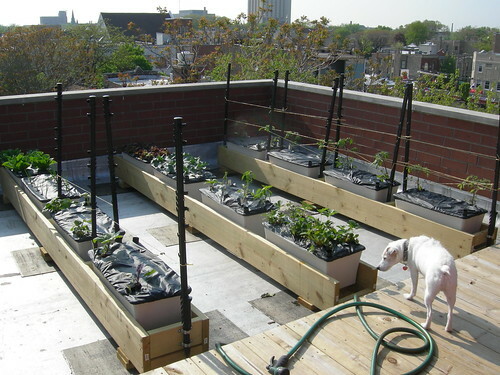 Sorry about hijacking the subject from the other thread (when I started writing it those posts hadn't been made) but I think earthbox-style growing is worth a thread of its own. I picked up a third one last weekend and some strawberry plants and peas (just the seeds, which is to say, dried peas). 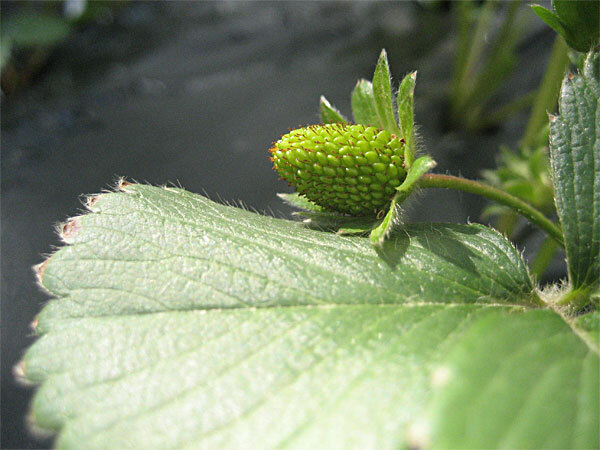 The strawberries transplanted fine, and I'm just starting to see a shoot poke out from one of the peas. Meanwhile, the lettuce on the left continues to grow like mad, though the other has hardly budged in the cool weather we've still had. Which makes me kind of wonder-- pretty soon I'll want to replace the lettuce with tomatoes and the like. I've just been picking leaves for salads, but maybe it's time to just rip up a whole head when I want one? The heads aren't huge, yet, but they're fairly good sized, and I could go ahead and plant onions or something. Any advice? Your tomatoes aren't going to go anywhere until it warms up quite a bit. 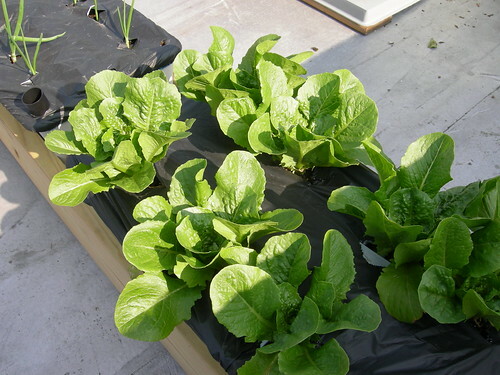 But the lettuce will continue to grow during cooler weather. One possible way to go is interplanting: put (very gently) the tomatoes in between the lettuces. They'll expand their roots altho' not much will be visible up top until it warms up. But meanwhile the lettuces will be continuing to provide you leaves. Once the tomatoes start to grow, the lettuce will start to bolt: at that point, yank the lettuce. But meantime they can co-exist w/o sapping the soil. 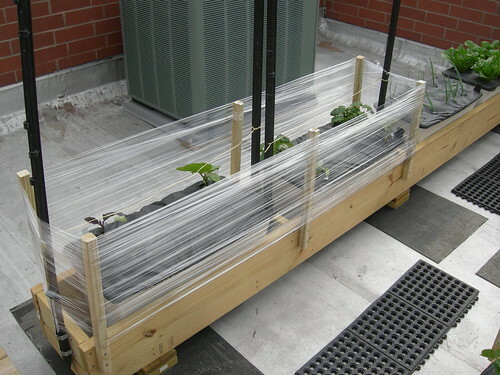 Or I could just let tomatoes continue to grow in their boxes at the nursery, too, and wait to buy them. Okay, I'll let the lettuce grow, and just pick "baby leaves" till then. One advantage to planting the tomatoes now is that their root system will expand during the cool weather, even tho' there's nothing happening above ground. Bigger root system = healthier, more productive plants. The problem you'll have with interplanting some plants with others in the EB is the planting scheme. 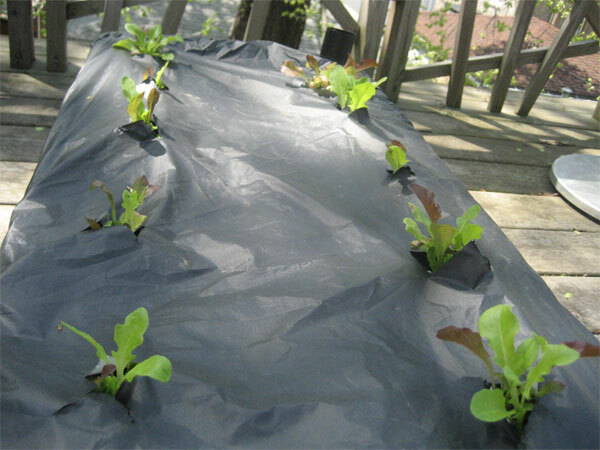 Try to interplant you lettuce with peppers or another 6/8 planting scheme since they both require the fertilizer strip in the middle. Tomatoes require the fertilizer strip on the opposite side of the plants, while only having two plants in the box. I've already planted my tomatoes since the EB keeps the soil warm. I've also tried to plant Cucumbers and Zucchini in the four corners with the fertilizer strip in the middle. It's yet to be seen if they'll grow well. 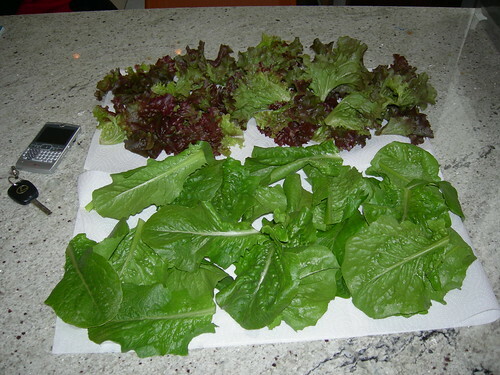 I'll have the same problem, as I have two boxes with lettuce that I really like (Romaine and Red Leaf). I may let them run their course then try some herbs or fast growing greens until the fall when I can throw some more lettuce in there. Let us know what you decide and keep us posted. Thanks. Or a fourth box. But then, geez, I just don't grow that many peppers and such. I want tomatoes and basil, mainly. That was pretty much the point. 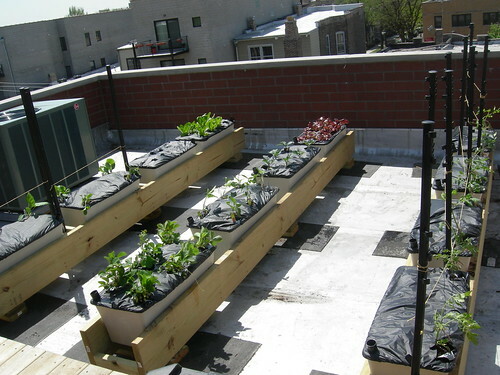 Like I said, I'm in the same situation but may end up converting one of my boxes to a 2/4 planter after my lettuce goes. In that case, I'll dig up the fertilizer strip and fill in with more mix, then place another fert strip along the side with the water source. I already have four boxes with tomatoes, since that's what I look forward to all summer. I may replace my lettuce with herbs this year but two boxes of herbs will get out of hand. I've heard from other EB growers that herbs grow like weeds in these things - especially basil. I've posted on the EB website for advice as well and will reply with whatever I learn. BTW, did you mail order your boxes or buy them locally? If locally, do you mind sharing where and cost? I'd just like to compare. Thanks. I was impatient and bought them retail (two at the place on Elston near Tony's Finer Foods, a third at Gethsemane), all in the $60-70 range. If I had planned ahead in any way shape or form, I would have mail ordered them and saved hugely, but they were all kind of in the nature of what-can-I-do-with-the-kids-this-minute activities. They're very excited about it all, so I don't begrudge it, but boy, if you can mail order them you'll sure save. I saw them at both places and couldn't believe the mark-up. I ordered 12 but went right from the company and my total cost was around $34/each, with shipping included. They arrived within 2 weeks via UPS ground. They advertise the boxes at $29.95 ea and s/h at $7.95 ea but you get breaks when you buy in bulk (3,5,10,etc). For a fun kids project, I wouldn't think twice about the cost either - especially with the instant gratification and same day project ability. Looks nice Tyrus. I suspect that there will be another advantage to the wind protection: you'll get a new rise in temperature for a sort of greenhouse effect. Might be too much in mid-July, but for the next month, it'll be a plus. Geo wrote: Looks nice Tyrus. I suspect that there will be another advantage to the wind protection: you'll get a new rise in temperature for a sort of greenhouse effect. Might be too much in mid-July, but for the next month, it'll be a plus. 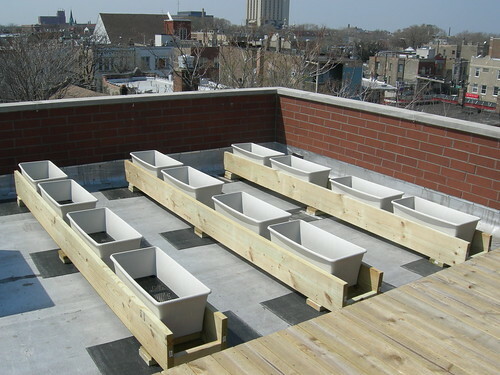 Has anyone completed a season of using EarthBoxes on a roof deck? I am curious how often the water needs to be filled in the heat of summer (say for tomatoes). We have a roof deck but live on first floor, so climbing up 4 flights of stairs would get old if it was needed everyday. Although I haven't completed a full season of earthbox growing (this is my first year), it's my understanding that you will need to water every day. I water every day now but it doesn't need it, since it's been so cool and the plants are still small. I've heard that once the tomatoes start really growing, you may need to water 2x a day but we'll see. Earthboxes Achilles heel is that they cannot dry out. If they do, it's hard to get them going again. I should also mention that when I planted tomatoes in large container pots in the past, I'd would have to water every day or sometimes multiple times a day. I will say; however, the earthboxes do require less water overall, but it doesn't mean you can skip days. 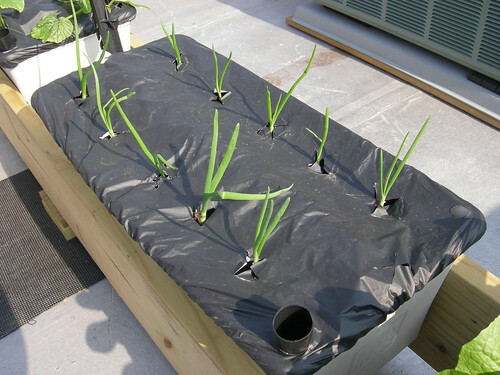 Your only option would be to invest in an automatic watering system for the earthboxes or any other kind of box. Sorry. and you're home free. I've designed and built all sorts of these automatic systems, up to and including a 50-grapevine drip irrigation system. The Gilmour timer is extremely reliable--I used one for 4 seasons. 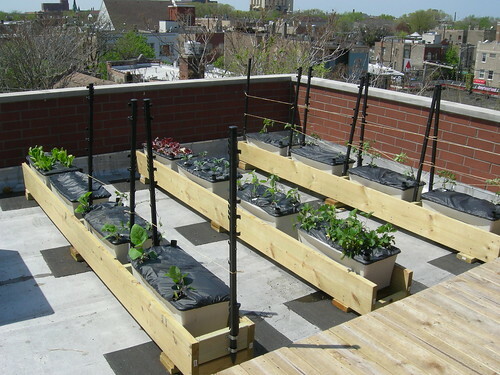 How would one go about setting up an automatic watering system for a series of earthboxes? I get the timer part, so do you just rig a bunch of y's so that each earthbox gets a hose? And is the timer sensitive enough so that you wouldn't overfill the reservoirs ? I would imagine the reservoir would be filled within 1-5 mins depending on water pressure. The electronic timers can be set to the minute. You could do several short intervals during the day, that way making sure there was always water, but never overflowing. The one box of lettuce is growing like triffids. I picked enough for a salad for four of us the other night and you'd never know it. So is that what you'd do, just keep picking leaves as often as you like them? Or would you start to cut some of the heads? And what happens after you do that, is the plant done? The other one is finally getting somewhere, too. And a few pea shoots starting to poke out, too. Wow, great production on your lettuce. Mine is doing well also - I think it has to do with the cool weather. My broccoli is starting to really grow as well. Basically, I've been cutting off the outer leaves on my lettuce plants but they are producing so fast that the plants will grow back whatever I cut off in a day or two. I've been eating romaine/red leaf lettuce salads everyday and adding it to every sandwich I make, etc. It's my understanding that once the warm weather hits, the salad will bolt and it'll be done. At that time, I've heard that swiss chard and escarole grows well in the heat. 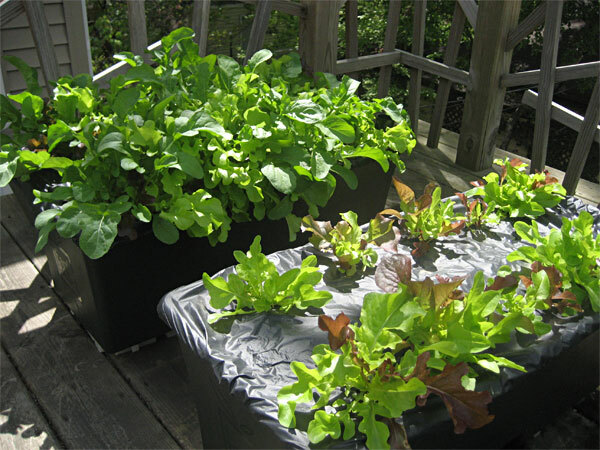 I'm planning on planting some herbs in mine, then swapping back to another lettuce in the fall. BTW, as far as an automatic watering system for the earthboxes, they sell one that doesn't use a timer. I believe it just uses a "floater" or pressure to determine how much each box needs. Go to the earthbox site to learn more (www.earthbox.com). Cheers. I don't get it. I have 3 romaine plants and a couple other lettuces that have barely grown AT ALL in the last 10 days. Certainly not enough to start harvesting anything. Could it be the soil is still too cold ? Not enough sun, maybe, where they are? tem wrote: I don't get it. I have 3 romaine plants and a couple other lettuces that have barely grown AT ALL in the last 10 days. Certainly not enough to start harvesting anything. Could it be the soil is still too cold ? Mike G wrote: Not enough sun, maybe, where they are? it's quite possible that they aren't getting enough sun. The planters (seen here) aren't in an ideal location - building directly to the west, large tree blocking light sometimes, but I think they get at least 6 hrs of direct light right now between ~7am and 1pm until the sun moves around too far. That should lengthen as the summer goes on but it's unfortunately the only option I had. Your most important sun hours are 10AM til 3PM, but for proper growth in tomatoes and fruit (I'm thinking my grapes, here) you really would be better off with 8 solid hours. And on 22 June the sun starts moving back south and the days shorten. Sigh. Not to worry, Tem - my back 40" has little leaflets, not even big enough to call mesclun - but it's well-shaded most of the day. 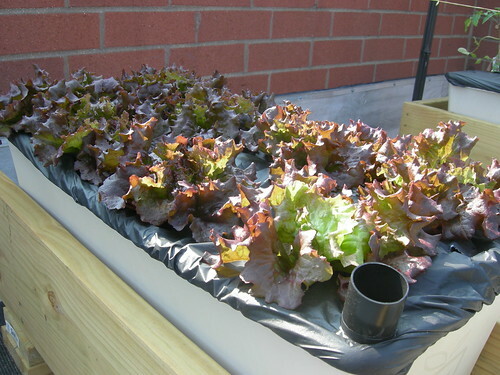 However, I've found that this also means it will be cooler and thus bolt less quickly, so you're possibly extending your harvest in the long run (I never planted lettuce in the sunny garden, so I can't compare) I don't think my lettuce ever bolted last year, although it did eventually get big enough to be woody. Mhays wrote: Not to worry, Tem - my back 40" has little leaflets, not even big enough to call mesclun - but it's well-shaded most of the day. 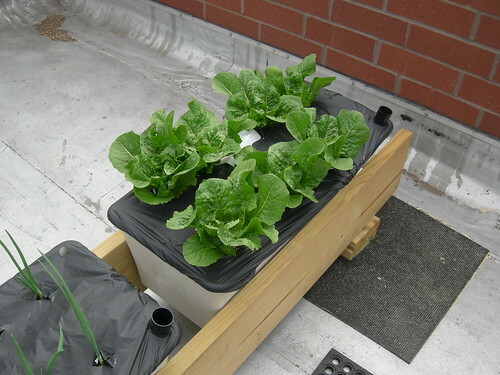 However, I've found that this also means it will be cooler and thus bolt less quickly, so you're possibly extending your harvest in the long run (I never planted lettuce in the sunny garden, so I can't compare) I don't think my lettuce ever bolted last year, although it did eventually get big enough to be woody.